Chimeric antigen receptor (CAR) T-cell therapy has been a great step forward for the treatment of relapsed/refractory adult diffuse large B-cell lymphoma (DLBCL) and children and young adults with relapsed/refractory B-cell acute lymphoblastic leukemia (ALL). 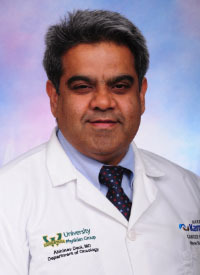 However, Abhinav Deol, MD, said medical science must find a way to make this approach available to more patients and expand treatment beyond hematologic malignancies. The CAR T-cell products currently approved by the FDA—tisagenlecleucel (Kymriah) for both ALL and DLBCL populations and axicabtagene ciloleucel (axi-cel; Yescarta) for DLBCL—have delivered significant results. However, these products also come with unique challenges including toxicity, such as cytokine release syndrome (CRS), access, and cost. In an interview during the 2018 OncLive® State of the Science SummitTM on Hematologic Malignancies, Deol discussed the basics of CAR T-cell therapy, potential new directions for these products, and the possible impact new products might have on the field. OncLive®: What are some of the key take-home points of your presentation on CAR T-cell therapy? Deol: I wanted to give people an overview in terms of what CAR T cells are, because it's a relatively new modality of treatment for management of patients with different types of cancers. There are some unique challenges in terms of which patients are appropriate to get CAR T-cell therapy; there are some toxicities that are unique to CAR T cells. Right now, CAR T cells are FDA approved for ALL up to the age of 25 for patients who failed conventional chemotherapy or transplant, and also for DLBCL for patients who failed at least 2 lines of therapy or who are ineligible for an autologous stem cell transplant. Finally, I wanted to discuss future interesting research in some of the other diseases, such as multiple myeloma, and some of the challenges—not only the scientific challenges, but also the costs associated with treatment. How would you describe the experience of seeing the rise and spread of CAR T-cell therapy? It is very exciting. My training, initially, was in immunotherapy and it's very satisfying to see an effective immunotherapy win approval. These are patients who didn't have any clinical trials available; some of them had failed on novel drug combinations and now they're cured of disease. Unfortunately, it doesn't work for everybody—not every patient is able to get this treatment because of organ function requirements and some of the other involvement, especially if they have central nervous system involvement. It has not been studied in that setting, but hopefully as we learn more about these therapies, we can use them in a broader sense in terms of having more patients we can take through these treatments safely and effectively. What factors do you consider when determining whether a patient is eligible for CAR T-cell therapy? The important thing is to first determine whether the patient meets criteria for the FDA-approved indication, because insurance companies carefully look at that to determine whether they'll cover someone treated with CAR T cells. That has been a challenge. Also, one must make sure the patient has adequate organ function. We need to make sure the patient's lungs work well, the heart works well, and they didn't have significant kidney dysfunction. These toxicities that happen after the infusion of CAR T cells require good cardiovascular system that can handle high fevers and CRS, so that the patient can make it through the initial complications. What are the most common safety issues associated with CAR T cells and how do you manage them? We worry not only about the associated chemotherapy side effects—nausea, vomiting, hair loss—because they do get some low-dose chemotherapy prior to getting CAR T cells, but the unique side effects we recognize with CAR T cells include CRS and neurological toxicities. The CRS can be, in some mild cases, characterized by fevers, chills, slightly low blood pressure that responds to intravenous fluids to, in extreme cases, fevers that are very high, and blood pressure that drops low enough to require medication.